Terrified child Angie Rodgers cowered under her duvet and prayed she would be spared. For five years, from the age of 11, she would suffer at the hands of her perverted father. Angie felt powerless as God-fearing Jehovah’s Witness Ian Cousins abused her on an almost weekly basis, even when they were at a church convention. She did finally pluck up the courage to tell church elders – only to be abused by one of them as well. Harry Holt molested her as they watched Braveheart together. He went on to abuse seven other girls. Angie says today: “I turned to the Church for help and I was abused a second time. “I was a child and they should have helped, but they turned on me. They make me feel sick. I don’t think I’ll ever get over what happened. I’ve just learned to live with it. Angie’s dad was locked up for five years in 2002. But justice only caught up with Holt last year when he was jailed for assaults on eight children dating back four decades. Now aged 36 and a mother of four, Angie waives her anonymity in a bid to help other abuse victims. She says: “Dad did it whenever he got the chance, even when I was ill.
“It started one night when I was just 11. I woke to find him touching me in places a father should never touch his daughter. “Once, I was throwing up with gastric flu when dad brought me home a fluffy bunny, with a peachy white floral dress and bloomers. “My mum went to the Kingdom (church) and my dad scooped me up in his arms from the couch, took me to his room and molested me. “I prayed my mum would come and save me but she never did. After that he used to try to touch me whenever we were alone. It got worse and worse. Angie was 15 when she confided in a pal whose father was a leader in a different congregation. Elders investigated and Cousins, now 55, was called to a “judicial meeting”. Angie was quizzed by three male elders including Holt, known as “Uncle Charlie” to children within the Kingdom Hall in Stevenston, Ayrshire. They asked intimate questions about where she was touched and how. Jehovah’s Witnesses elders cannot act against suspects unless “there is a confession or two credible witnesses”. Members can return to the same church if they show repentance for their sins. And while elders admonished Cousins he was allowed to stay in the congregation – and the abuse stopped. But months later, in 1997, Holt pounced on Angie after they went door-knocking for members. She says: “It wasn’t unusual to go back to Holt’s house for something to eat, but this time his wife was away. “He put Braveheart on and soon after said he needed a wash. It got to the bit in the film when Murron gets her head chopped off when Harry came out of the shower and into the living room. “He only had a towel wrapped around his waist. He asked me ‘are you tickly’ and tried to touch me. The shocked girl told her parents and a meeting was held in her home with Holt. He was later stripped of his privileges as an elder and fled to Edinburgh. Last year a court heard he went on to abuse more children. Angie, who still lives in Ayrshire, adds: “I feel bad I didn’t tell police at the time and in a way I feel responsible for what happened to the others. But, as a Jehovah’s Witness, I couldn’t. The Church teaches you to keep the family together. “We were discouraged from mixing outside the faith. I wasn’t allowed to go to parties or sleep-overs. We didn’t ­celebrate Christmas or Easter and I was bullied at school. If I was caught with other kids my dad would hit me. “I was scared of Dad. I thought if I told anyone about what happened I would bring reproach on Jehovah’s ‘good name’. I thought the elders were so powerful – above even police and social services. Angie finally found the strength to make a police complaint about her father in 2000 – when a second girl told officers she had been abused. He was convicted of indecent acts on Angie and two other girls. Angie turned her back on the Church at the age of 19 and began a new life. But the religion encourages members to shun those who leave and Angie says her mum didn’t speak to her for six years – and only saw her first two grandchildren when they were five and three. By then Angie had put Holt’s assault “to the back of my mind”. But in 2014 another victim made a complaint and Angie agreed to speak up. 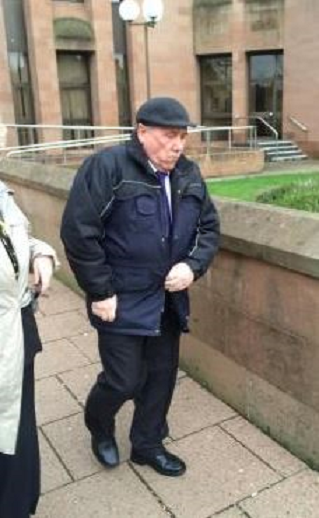 In February last year retired engineer Holt, 71, got three-and-a-half years at Kilmarnock Sheriff Court for abusing eight girls between 1971 and 2004. One was assaulted as he questioned her about the Bible and morality. He later officiated at her wedding. Today Angie hopes her story will help other victims. She says: “If what happened to me helps just one young woman – or boy – go to the police it will have been worth it. What happened to me is horrendous but I’m trying to move on, otherwise my abusers have won. The religion is nothing but a cult. Children are kept silent by fears of Holy damnation and Armageddon if they bring the Church into ill repute. The Church refused to be drawn on specific details of Angie’s case, saying meetings were confidential. A CHURCH elder who sexually abused vulnerable children was invited to speak at his first victim’s wedding, a court heard. A court was told Harry Holt, 71, now of Rutland Street, Nelson, went on to attack seven more girls as young as nine after the Jehovah’s Witnesses failed to report him to police. When the matter was raised, a local beat officer advised parents to ‘just keep your children away from him’, the court heard. Holt is facing a lengthy prison sentence after being convicted of attacks against eight girls in Scotland dating back over 40 years. His first victim, now 56, described Holt telling her he would deny touching her and that nobody would believe her. She told Kilmarnock Sheriff Court: “As a child I was made out to be a liar but Charlie knows I’m not lying. “My mother and father were treated very badly and it caused disruption in the congregation. They were of very good standing. “The local bobby was there and my mum and dad asked him what they should do and he said, ‘just keep your children away from him’. The woman, then 14, said a judicial committee of elders was held where Holt admitted groping her but not sexual touching. The court heard at 19 she got married and her mother insisted that Holt should officiate which caused a ‘big row’ as ‘it wasn’t until years later that she found out why’. Another victim, now 32, described Holt abusing her in the jacuzzi at the Magnum leisure centre in Irvine, Ayrshire, when she was between 14 and 15. The court heard the visit was laid on as a treat for ‘pioneering’ door to door with leaflets and church magazines. Holt, a retired engineer, and his wife later moved from Ayrshire to the Edinburgh area, although the victim still saw him through the Jehovah’s Witnesses. Holt, was found guilty of 11 charges of indecent assault and lewd and libidinous behaviour in Seamill, Dalry, Saltcoats, Kilbirnie, Stevenston and Kilwinning, Ayrshire, and in Gorebridge, Midlothian, between May 1971 and August 2004. One of the attacks took place in a Kingdom Hall meeting place run by the church, the court heard. The crimes came to light when two victims shared their experiences years later and went to the police. Sentence was deferred until next month and Holt was remanded in custody.